I shook my head from side to side and let out a long-exasperated sigh. My patience, exhausted; it’d been, one of those days! Greg and I looked at one another and laughed out loud. We love how our kids think! Nothing mischievous in their intent. No ill motives guiding their thoughts. They weren’t ill-behaved teenagers trying to get rid of their parents. Instead, they reminded us of a best practice we’d forgotten; mom and dad need to date, especially when they get cranky! Ecclesiastes 9:9 (the message bible) “Relish life with the spouse you love each and every day of your precarious life. Each day is God’s gift. It’s all you get in exchange for the hard work of staying alive. In our book, What I Wish My Mother Had Told Me about Marriage, we provide ten steps to make your marriage thrive. Dating ranks high on that list. But, not just any ordinary dating; we encourage couples to date with intentionality. Jesus taught the “Beatitudes”, here’s our thoughts on the “Be Date-atudes” and 5 tips for dating your spouse! Though it may seem counter-intuitive to spontaneity, planning a date and getting it on the calendar is more important. Make dating a priority by choosing a time for weekly connection. How do you WOW? When planning your date consider the following questions: What would make your spouse feel special? How can you communicate that they were at the forefront of your mind when you planned the date? How can you make the evening all about them? What would you wear if it were the first time you were going out? What could you do that would make their heart skip a beat, cause them to do a double take, or make them feel like they just won the lottery? Remember, it doesn’t have to be expensive. It’s the intentional thought that will make the difference, not the price tag. Don’t get stuck in a rut! Consider the five senses: sight, sound, smell, touch, taste. How can you welcome these five qualities into you date? Maybe wear their favorite smelling perfume/cologne? A favorite food? A reaching out to hold their hand over dinner? Keep this question at the forefront of your thoughts: How can I turn this night into a favorite memory? Along with creativity, wowing and planning arises the concept of intentionality. Before your date, spend some time thinking of one or two questions you want to ask to cultivate meaningful conversation. Arrange a view. Write a note and send it to them earlier in the day that will help build anticipation and share your excitement of connecting. Shut off the phone and shut out the worries of the day. Put your to-do list to the side. Look at them, not the TV screen behind their head or the vast group of people surrounding you. Listen for understanding. And let them know how glad you are to share time with them. 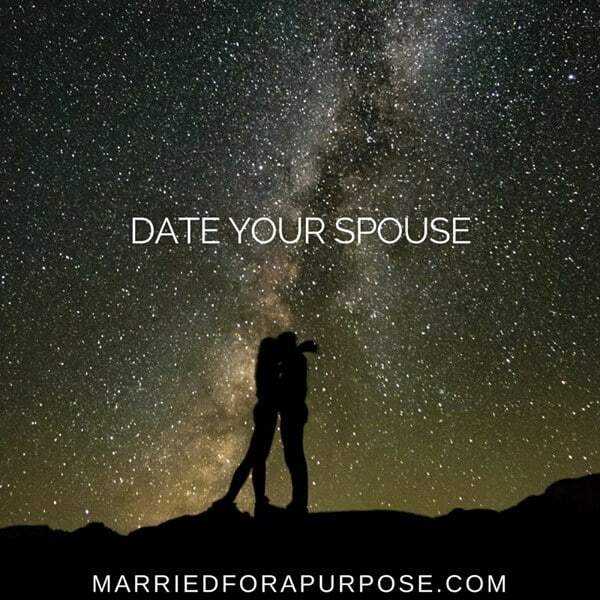 For more inspiration and insight, pick up a copy of our book here and visit us on Facebook to take the daily challenge of making your marriage thrive. Father, so many things crowd out our connection. Help us to remember to safeguard what matter’s mose – YOU and ONE ANOTHER. In Jesus’ name, amen.